Don't you love it when you pick up a book without huge expectations and then completely fall in love with it? Me too! :) That recently happened when I read Kristi Hunter's debut, A Noble Masquerade. Here's a blurb, and we'll chat on the other side! I had the chance to read this book on my recent vacation. I figured it would fill in the few quiet moments I had, but quickly became so sucked into the story that I didn't want to put it down. Hunter does an amazing job crafting two leads who you root for individually and as a couple. Their immediate chemistry is eclipsed by how well their personalities compliment each other. They challenge one another and yet see the best in each other. And they are downright funny together at times. I found myself smiling my way through the book. Add in the light mix of suspense & mystery--which is never drawn out needlessly--and both hero and heroine only shine brighter. These are two characters who stayed with me even after I turned the final page. And though the plot is slightly predictable, that in no way dimmed my enjoyment of this book. Hunter's writing voice, the plot itself, and the characters she created all flowed together seamlessly. 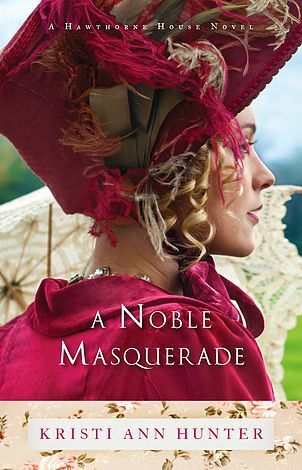 I happily give The Nobel Masquerade 5 out of 5 stars and you can purchase it here.